A lost tooth carries more than just the tooth itself – it also carries	the roots. When permanent teeth are lost, the roots are lost too. When	teeth were missing, the only options used to be bridges or dentures. Now,	dental implants offer you a more permanent solution to your lost tooth	problem. 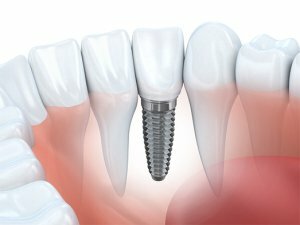 They are designed to look and feel like the teeth surrounding	them just like bridges and dentures, but dental implants fuse with the	bone to ensure that they stay permanently. Mumbles and slurs due to ill-fitting dentures can become a thing of the	past, and you will no longer have to endure the discomfort of removable	dentures. Dental implants allow you to enjoy your favorite foods that	you might have avoided with dentures, and with the proper maintenance,	they can last a lifetime. If you’re ready to ditch your old dentures	or avoid bridges, be sure to check out our Falls Church dentist office. Give us a call at (703) 237-4521.